As the name may imply, this is a tongue-firmly-in-cheek fantasy role-playing game with character creation, classes, unique skills that allow you to solve encounters in a variety of ways, and a small open world for you to explore. There are a lot of things to make fun of about your dungeons and dragons Tolkien-inspired fantasy role-playing games, and while I love them I also think they take themselves way too seriously. Meanwhile there’s serious topics that I don’t think we are silly enough with. So the initial seed for Hero Adventure Quest involved me asking, “What if you could defeat a kobold with Marxism?” Of course, this changed to a succubus as my first test encounter, and Feminism as one of the ridiculous skills you could apply, but you get the gist. That fed directly into all the choices I made as I started exploring how I wanted players to express themselves in the game. What happens when we combine the skills of classic fantasy games – fireballs and swordplay – with those of a modern intelligentsia – such as feminism and postmodern discourse? To make it work functionally, I made everything into a specific discrete skill, and allowed players to pick up an unlimited number of skills from a variety of sources, whether they are quest rewards, earned from a university or mage tower, or simply found in a loot chest. “Skills” just functioned as new choices unlocked when resolving conflicts, so the more skills the player had the more variety of options they potentially had.. At the time, I was still learning a lot about what choice-based interactive fiction really meant and this was a way of experimenting with it. 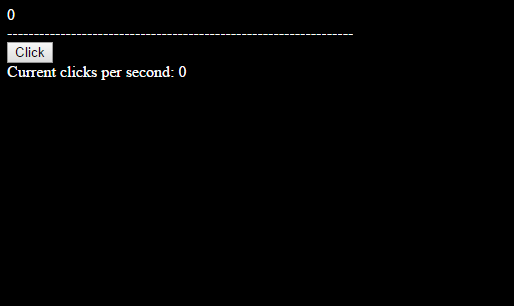 I made it in Twine. That was my biggest problem. Hero Adventure Quest RPG is actually the second game I ever started working on when I embarked on making side projects back in 2013. Prior to this I had only made ISIS, also in Twine. I was fascinated by the tool and wanted to see what else I could make with it. made a node-based map with a coordinate system. made character generation with gender, race, name, classes. implemented classes and leveling via earned XP. These are not things Twine is known for, and implementing each of them meant working against the strengths of the tool. Expanding on what I had seemed like too much effort. The other problem? I did not have any sense of scope and I knew it. I knew while designing this that it was completely untenable to make an open world (even if it’s small) RPG with a huge collection of skills and branching events. There was no way I would ship that. This is what made abandoning the project easy and painless: I think I always knew it was just a design exercise and nothing else. As a design exercise I think it was a success. The things I learned from this game led me to work on Flesh Totem (the next game on my abandoned list). And while I abandoned that game too, I learned a whole lot more about choice-based interactive fiction and helped cement my writing style. The state of the game is really rough and very incomplete. You will run into dead ends quickly. The back button or refresh button will break the game, so use “RESTART”. There’s almost no skill logic – I just pretended the player has all the skills for the purpose of exploring the design possibilities. There is a way into the mage tower but I forgot how. Good luck getting in. I believe there are only a couple encounters – the succubus, possibly elves (I can’t remember if I finished them), and the mage tower. The name for this game was always a placeholder but I think it gets the feel across. If you aren’t into horror you should skip this game. Flesh Totem was about an alternate reality that blurred the difference between “mechanical” and “biological”, where computers are born, not assembled. You play as a kind of quarantine scientist in space. Your job is to investigate why one of the ships in the fleet instituted quarantine protocols, make contact with the crew, and then take the steps necessary to make it safe for the rest of your crew to investigate and repair the problem. The computer – and the mechanical guts of the spaceship – are a Cronenberg-esque mix of biological and mechanical parts. Since it’s a horror game, the infection is obviously “humans” and the only way to cure the ship is to kill the last crew member hiding in an airlock. I also had plans for having the player empathize with the computer, whose children were being harvested as CPUs for the fleet. It’s a weird game. If you have played Mainframe, a procedural horror game I made with Jurie Horneman, then you will see a lot of interesting parallels where I cannibalized concepts from Flesh Totem. Both star a computer that consumes data, that data that comes in both mechanical and biological form, takes place in a ship described in terms of lungs and umbilical cords, and a whole lot of gross body horror. Functionally, Mainframe builds on some of the ideas I had in Hero Adventure Quest. It has a world model you can explore. It has an inventory of objects that allow you to unlock new choices in different spaces. It plays more like an adventure game with proper lock-and-key gameplay rather than the type of Twine games that were really popular at the time, which focused more on exploring a story rather than solving a conflict. Flesh Totem has a lot of potential – and in reviewing it for #BringOutYourDead I am almost tempted to revive it. Ultimately it because unwieldy: I didn’t have a good system for planning out locks and keys. There was no puzzle dependency diagram. I was struggling with the climactic moment, where you meet a crew member who trapped himself in an airlock to protect himself from the computer turning on them all. 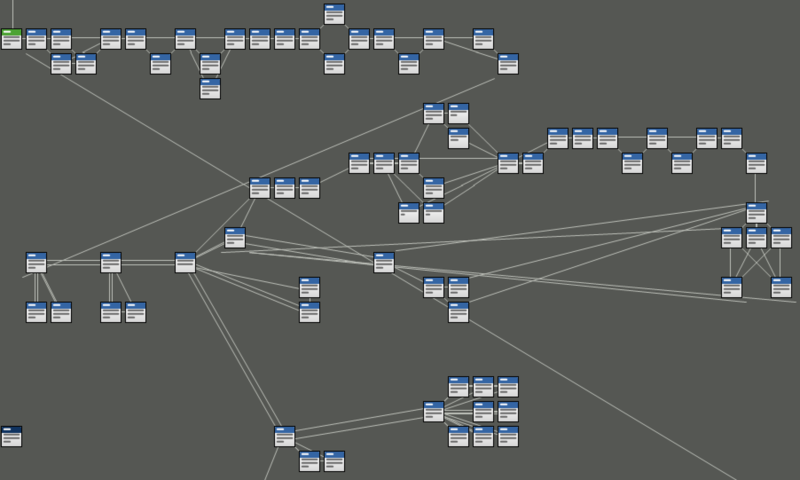 On top of that – again – I was making this game in Twine and honestly the amount of logic I wanted to use meant I should’ve focused on a different tool. But I didn’t know of any others at the time that allowed me to work without being blocked by lack of programming skill. I abandoned it when I started on Her Pound of Flesh for AsylumJam. Her Pound of Flesh was actually supposed to be a writing exercise so that I could explore different ways of describing body parts, and the language is deliberately very similar. Instead Her Pound of Flesh ended up being the final project and I lost the motivation to return to Flesh Totem. It’s surprisingly playable. Please, though, don’t judge the writing too harshly – it is a rough draft, remember, and a lot of passages have placeholder descriptions of if-statements. It’s possible to get to an ending, but I don’t know if it’s possible to get stuck or not. The macro error you see doesn’t affect the gameplay – it was to update your inventory (which is invisible, unfortunately). 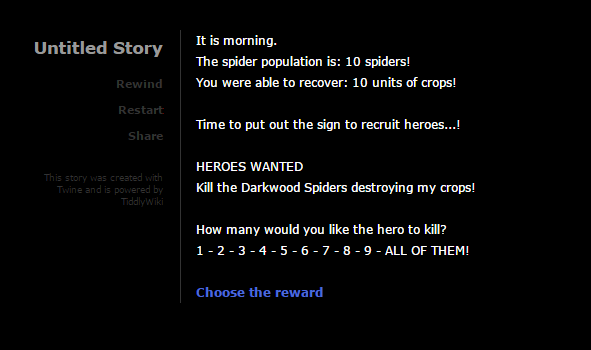 This was built in a much older version of Twine than is available now. In this game I wanted to explore the logical inconsistencies with NPC questgivers in MMOs. I wanted you to play from the point of view of a man or woman who seems to always have a problem with a spider infestation, and there’s always a hero around ready to help them for a fee. Eventually, though, you run out of money and have to negotiate, haggle, and beg these so-called “heroes” to help you even when you can’t give them anything. You even start to give up your own XP to give it to these heroes until you de-level so far you die. Even my silly games get depressing. I started working on this game for a game jam – I forget which – but lost interest. It’s just not a very compelling topic. 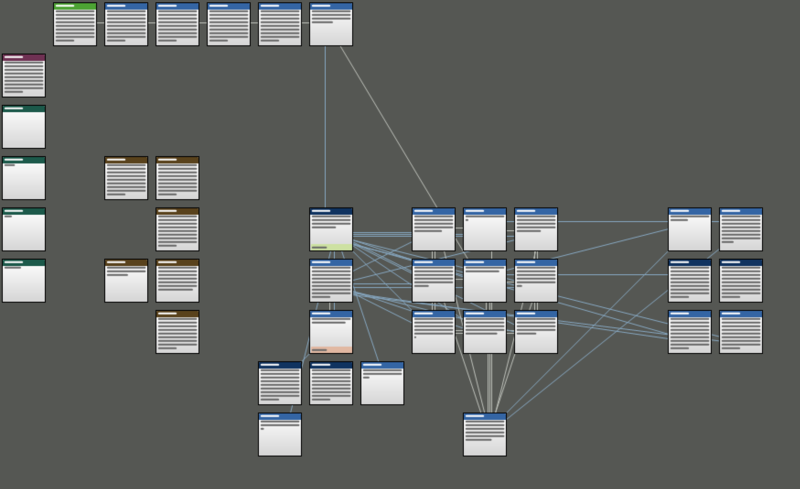 The actual playable version is more like an interactive design document in Twine. Normally I wouldn’t include it in a compilation of unfinished games, but it shows my thought process when I design. One of the themes for Ludum Dare was “Beneath the Surface” so I decided to try making a game where you scratch off lottery tickets. I technically succeeded. It only took a couple hours to get this far. I used Construct 2 to build the prototype. Once I was done I asked, “Okay, so what now?” I didn’t have an answer. I partly include it because I talk to a lot of aspiring designers or hobbyists who are really self-critical and feel like their work isn’t very good. If you ever feel like that, I recommend you recall Scratch-Off Simulator, a game made by a paid professional game designer with many years of experience behind her. The seed for the game came around the same time the #BlackLivesMatter movement began and forced many of us to look hard at state-sanctioned violence against its citizens. I had also read a news article about an American teaching English in China being reprimanded for using the children’s game of Hangman to help teach spelling. I mean, obviously, when taken out of context of our culture, drawing someone literally being hanged unless you guess the right letters seems excessively morbid. These two got stuck in my head and led to Historical Hangman, an attempt to represent some of the people who’ve died at the hand of the state, and turn it into a farce of a children’s game – the juxtaposition of the two just felt right. Most of my examples are people who died from state executions, but I drew no line between them and those killed by police or by mobs as the police looked aside. My only requirement was that there was a record of the deceased’s last words. Those would be the words you’d need to guess to ‘save’ them from the hangman. The game exists in the form of images, a kind of representation of the final structure of the game. These are the only mockups I could find, but I had many more quotes collected outside of them. 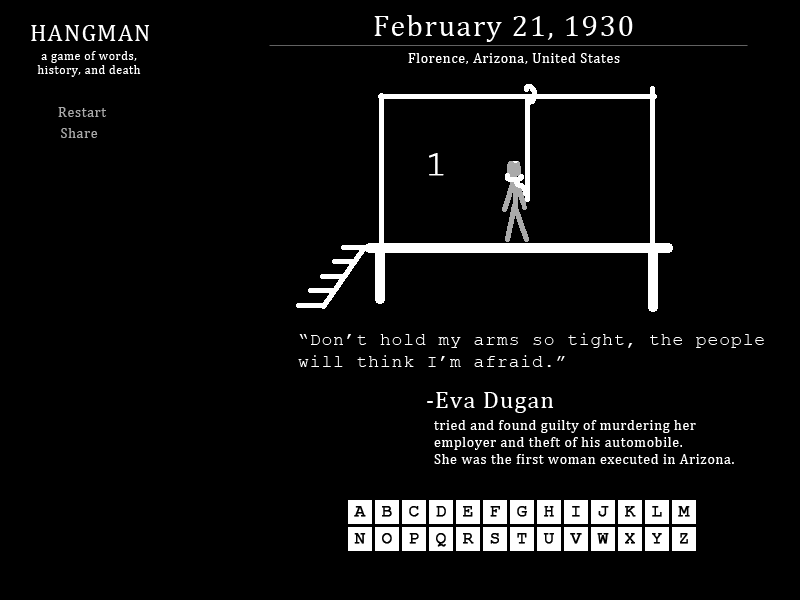 I tried several times to make a visual hangman game but my programming skills are just not there so I’ve given up. (If you pay attention, you can see I mocked it up in Twine as a simple visual tool). I’m aware I’ve lumped together murderers or terrorists along with those executed for their beliefs or skin color. I’m against the death penalty in all cases. I found it more interesting to explore the extent and variety in which a state murders its citizens, rather than focus only on the redeeming cases. Now that I’ve thoroughly depressed anyone reading this entire post, I’d like to present InfiniClicker. Clicker, or idle, games are a fairly recent phenomenon popularized by the almost simultaneous viral popularity of Candy Box and Cookie Clicker. Most clicker games have more in common with the latter. There’s a lot of interesting design possibilities in this space. The good ones are economic systems that slowly reveal new possibilities over time, allowing for a sense of discovery. If you are new to this genre, I highly recommend the Kittens Game and Idle Factory if you’re interested in more hands-on clicker games. If you like clicker games that are more idle, then I recommend Cookie Clicker or Shark Game. A more polished clicker game would be Clicker Heroes or AdVenture Capitalist. Which is why InfiniClicker is probably the most boring clicker game in existence. Since I didn’t have a plan on where to go next, I abandoned it. If you’re looking at this game and thinking you’d love to try something like it, feel free to steal the html and .js file and modify them however you want. I debated whether or not to include this game. The amount of playable space is inversely proportional to the amount of work (and rework) I’ve sunk into it. Since this is a really important unfinished game to me, I feel it’s appropriate to share it. 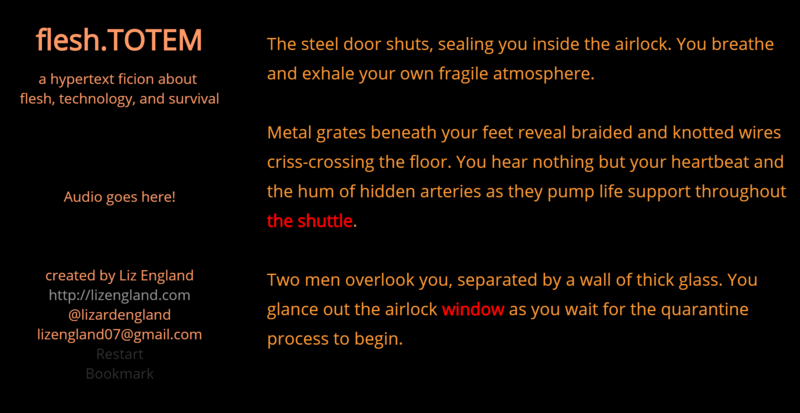 My functional goals for this game were to explore the use of twine as poetry, with interesting use of prose and line breaks, as well as typographic elements, all to create a sense of foreboding and dreamlike atmosphere associated with memories. If you play it, you’ll find a handful of functional scenes with very little text, and a lot of effort on the aesthetic feel of the game. You were meant to explore the game by jumping from memory to memory via word association until you reached the end. However, there’s a lot more to this game that you will never experience. The story is told from a woman describing the memories she has of her mother from her childhood and until the day she moved out as a teen. They are juxtaposed with stories the daughter tells of the previous year, as an adult who has moved back in with her mother to help care for her. The daughter is convinced that an evil spirit has taken her mother’s place, inhabiting her body and wearing her skin. Her mother is a stranger now – violent, inconsistent, dangerous, prone to alien behavior that cannot be explained by any rational mind. The daughter tells this story as her last words as she finally gathers the will to destroy this creature masquerading as her mother. It Wore My Mother’s Face is a slow, creepy ghost story meant to terrify you with the idea that those closest to you could be liars, creatures in disguise. But the other meaning of the story is that her mother has dementia. The game never states this, but it is consistent with the memories and experiences told by our unreliable and hyperbolic narrator. It’s a game that ultimately explores what it means to grow old and age, and become strangers from the people we once were, unrecognizable to ourselves and to others. Our skin sags. Our bodies weaken. Our reflexes slow. Our minds deteriorate. 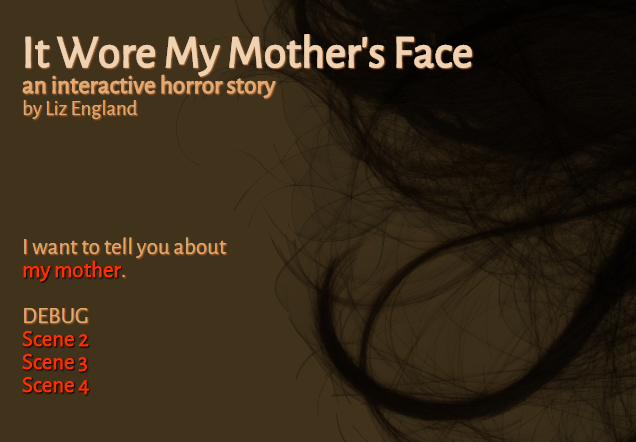 I continue to believe that It Wore My Mother’s Face has a lot of potential for being a really good story, and not just a good horror story. But I can’t make it. Every time I tried to work on it, I tried moving it into the realm of fantasy and it kept on coming back to more autobiographical moments in my own life (family with dementia, complicated relationships with mother figures, the usual). So even though the game was intended to be entirely fictional, I found it was just a bit too close to my heart. That tied with the difficulty of writing carefully about an unreliable narrator who essentially murders an ill family member with dementia – a person she was supposed to take care of – thwarts any attempt to progress. I often find that whatever I am working on professionally in the office, I usually want to explore the OPPOSITE in my side projects. This is why I have so many projects focused on interactive fiction while I was designing mission systems and doling out loot in an open world game. There’s absolutely zero overlap between the two. At one point I started to really miss level design. I find building levels a really meditative experience for me. I could work for hours without a break, listening to music or watching movies, and just build, build, build. Then Unreal 4 was released into the world and level designer hobbyists around the world rejoiced. I tried out a bunch of different projects but the only one I saved was Tower of Babel. It will probably disappoint – it can only barely be called a game because it comes with the first person shooter template. This game was supposed to be my walking simulator. You walk up the Tower of Babel. Maybe you climb, jump, and shimmy at times too. But mostly it was about approaching a great tower and ultimately ascending it, learning the stories of those who came before and abandoned their quest even as you continue it. All that exists are some level design experiments to try to figure out architectural style as well as level design forms that intimidate and dwarf the player. I did not get very far. I’ve included images and animated gifs of the buildings I have. This was my first experiment modeled off of the famous renaissance painting of the Tower of Babel. I wanted to see how much room a spiral staircase would take up in order to gain any appreciable height. It doesn’t have walls because those weren’t important for this test. I quickly discovered that it requires a LOT of geometry to get only a short distance. Of course the real structure would be wider but… I didn’t think the curved architecture was that compelling to continue in this vein. The Tower of Babel is largely thought of as an adaptation of a Sumerian myth combined with the real world location of the Ziggurat of Ur. 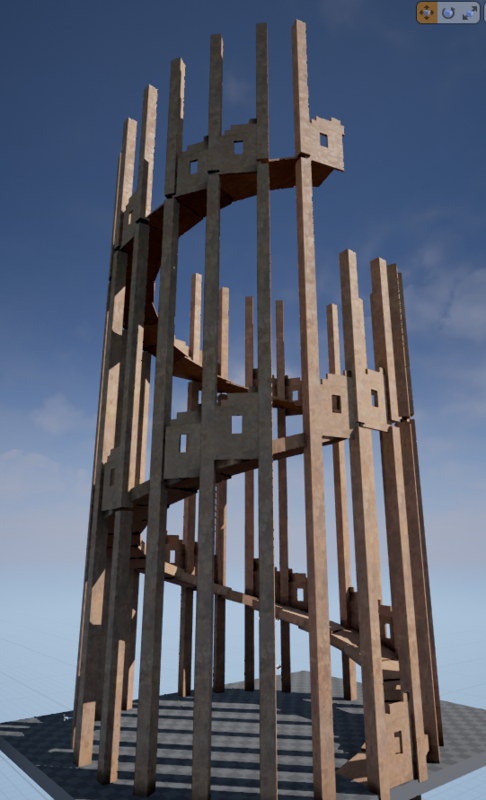 I modeled this Tower off of that ziggurat and various Sumerian-styled architectural concept art I found online. It’s huge and imposing. It’s very geometric with a combination of right-angles and slanted sides. My biggest problem is that I built it out of BSP. It wasn’t long before I ran into the usual problems in Unreal with odd angles cutting the geometry weirdly and creating disappearing polygons. (Yes, I worked closely to a grid. No, I am not perfect). The technical errors are what led me to abandon the building, but it was never meant to be a final product. It was – again – a level design experiment in creating a large architectural space that I could reuse for a Tower of Babel project. I think the architecture in this is fantastic at created a space that dwarfs the player, standing imposing out of the desert. 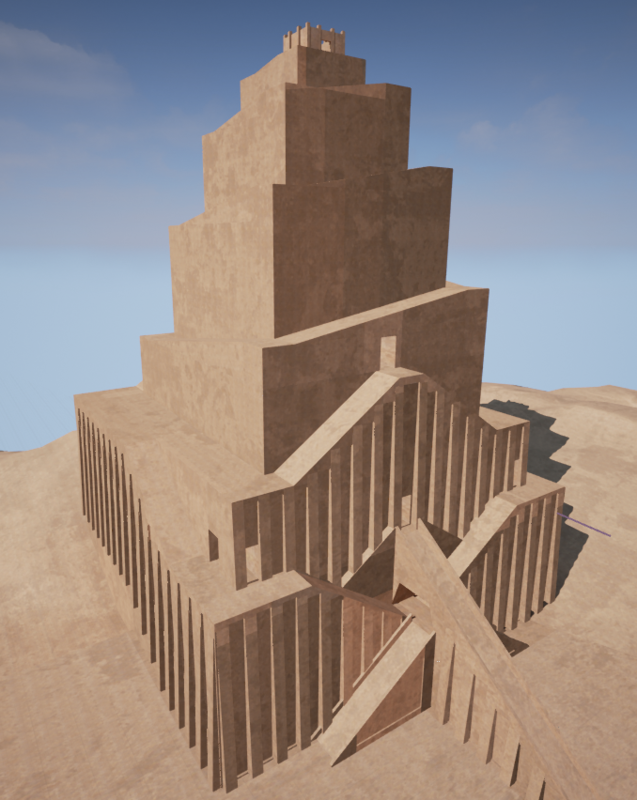 If I ever return to a Tower of Babel style game, I will borrow a lot from the geometric style of the Sumerians. This isn’t even a tower. This is again just an architectural experiment, and this time I was thinking about turning the Tower of Babel into a broader city with a single tower as a centerpiece instead. 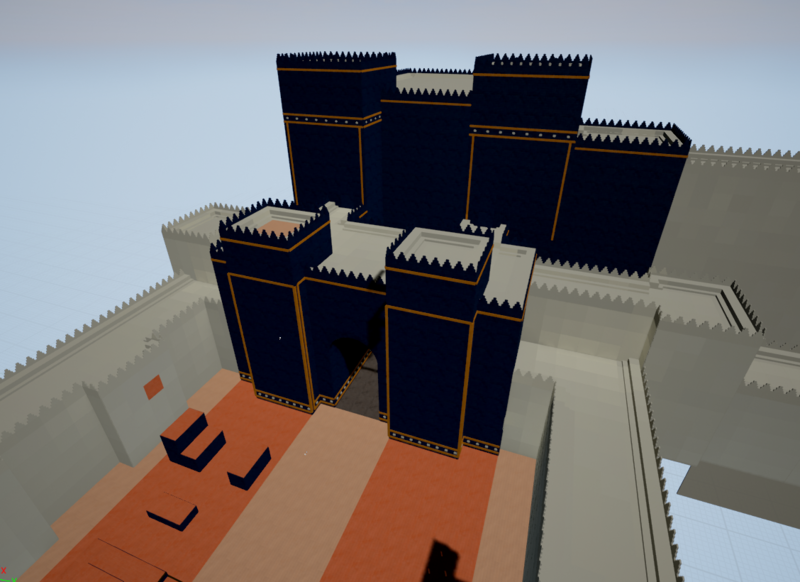 You might actually find this level familiar: it’s a recreation of the famous Babylonian Gates. It’s accurate as far as I can tell, though the scale may be off. It looks impressive and promising until you actually get into it in first-person, and then it just feels underwhelming. The interesting details are in the rooftops, but from the ground level you just can’t see it. I made a pretty rookie mistake of building it without the player’s view in mind. In the courtyard you can see a bunch of blocks – these are metrics tests for running, walking, jumping, and climbing. I didn’t implement these but you can see some of the intention behind my walking simulator here.